The central nervous system (CNS) is extremely resistant to infection by bacterial pathogens due to a combination of protective effects of its bony structures (skull and vertebral column), the meninges, and the blood-brain barrier. However, once infection has initiated, the CNS is generally more susceptible to infection than most other tissues. Host defense mechanisms that are normally seen in other areas of the body are inadequate in the CNS for preventing bacterial replication and progression of the disease process. The deficiency of immunologic components in the CNS is crucial, as specific antibody and complement components are essential for opsonization of encapsulated bacterial pathogens and their efficient phagocytosis and elimination. Preexisting and/or predisposing conditions are a strong component of the severity of bacterial CNS infection. These include respiratory and systemic infections, head trauma (see the following image), previous neurosurgical procedures, malignancy, alcoholism, and other immunodeficiency states. Despite advances in diagnostic techniques and therapeutic interventions, the combination of the bacterial virulence and the patient’s immunostatus contributes to high morbidity and mortality rates associated with bacterial infections of the CNS. Bacterial meningitis (gross). Staphylococcus meningitis after head trauma showing purulent exudates over the entire convexity with associated cerebral edema and vascular congestion. Bacterial infections can involve different compartments of the CNS, leading to different clinical and pathologic manifestations. In addition, some microorganisms are more prone to involve particular regions of the nervous system. Three major infectious syndromes are defined according to the site and nature of the inflammatory reaction: meningitis, abscess, and encephalitis. Meningitis is the inflammation of the leptomeninges and the most common central nervous system (CNS) bacterial infection. This condition may become evident over hours or days (acute) or over a longer period (subacute or chronic). Acute bacterial meningitis, or purulent meningitis, is a severe illness characterized by purulent cerebrospinal fluid (CSF); the condition is rapidly progressive and, without treatment, it is fatal. The presentation may vary depending upon the age of the patient, the presence of underlying conditions, and on the microorganism causing meningitis. Go to Meningitis and Imaging Bacterial Meningitis for complete information on these topics. Bacteria invade the CNS following direct inoculation of the brain parenchyma or by spread from a focus of infection outside the CNS. Hematogenous spread is the most common route, and the upper respiratory tract is the most common source of entry of microorganisms. Meningitis may also be established after direct spread of pathogens from adjacent structures to the brain, including the paranasal sinuses and middle ear and mastoid sinuses, as well as through a retrograde route via emissary veins from the face or scalp. Inoculation of pathogens may also result from direct implantation by trauma in penetrating injuries and compound skull fractures, following surgical procedures and invasive diagnostic and therapeutic interventions, and due to congenital defects such as myelomeningoceles. Specific agents of bacterial meningitis also vary according to age group and host immunostatus. In the neonatal period (newborn to 29 d), important pathogens are aerobic gram-negative bacilli, including Escherichia coli, group B-hemolytic streptococci, L monocytogenes, and Klebsiella species, among others. During childhood and adolescence, N meningitides and S pneumoniae are the most common agents in the community population. In adults, the most important agent is S pneumoniae; especially at risk are alcoholics and people with chronic otitis, sinusitis, mastoiditis, CSF leaks, pneumococcal pneumonia, sickle cell disease, or asplenia. In the elderly population, L monocytogenes and gram-negative bacilli (most often E coli, Klebsiella spp, or Enterobacter spp) are the most common pathogens. Meningitis secondary to head trauma and following neurosurgical procedures may have different pathogens including Staphylococcus aureus, S epidermitis (particularly in patients with CSF shunts), and aerobic gram-negative bacilli (Pseudomonas aeruginosa). The classic triad of meningitis symptoms includes fever, headache, and nuchal rigidity. Passive flexion of the neck is restricted and painful. In severe cases, attempts at neck flexion may induce flexion of the hip or knee (Brudzinski sign), and there may be resistance to passive extension of the knee while the hip is flexed (Kernig sign). Neck stiffness and Brudzinski/Kernig signs are termed meningeal signs or meningismus; they occur because tension on nerve roots passing through inflamed meninges causes irritation. In the acute phase of the disease, purulent exudates are seen grossly within the subarachnoid space. Marked congestion of the leptomeningeal vessels and cerebral edema may be prominent. See the following images. Bacterial meningitis (gross). Severe purulent meningitis involving the base of the brain and lateral sulcus. Multiple, superficial cortical infarcts (inferior frontal lobes) due to infective arteritis are present (same case as in the previous image). Bacterial meningitis (gross). Ventriculitis due to acute bacterial meningitis. The ventricles are dilated with purulent collection occupying the entire left lateral ventricle. Microscopically, the meninges display abundant cellular infiltrates composed of neutrophils accompanied by fibrin exudate. 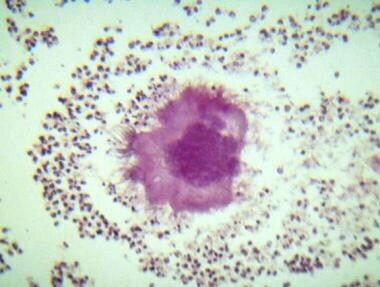 Intracellular and extracellular bacteria may be seen. Once the infectious process is brought under control due to treatment, subacute or chronic phases may start with change of the cellular inflammatory infiltrates to mononuclear cells, including lymphocytes, plasma cells, and macrophages. Variable proliferation of fibroblasts may occur with a resulting leptomeningeal fibrosis. See the images below. Acute purulent meningitis. Intense inflammatory infiltrate and congestive vessels are present. Acute purulent meningitis. Inflammatory exudates composed of neutrophils and fibrin are present. Note the permeation of inflammatory cells in the superficial brain parenchyma. Acute purulent meningitis. Purulent exudates surrounding cranial nerves can be seen. 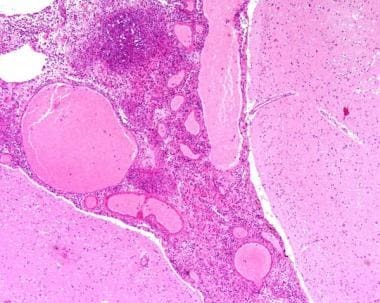 A brain abscess is a focal infectious mass lesion within the brain parenchyma that has central necrosis, inflammatory neutrophilic infiltration, and capsule formation. 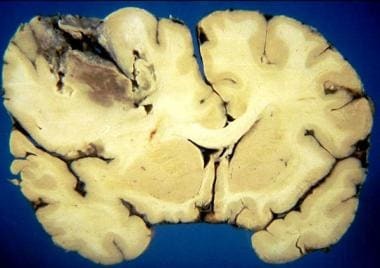 Brain abscesses are the second most common infectious process of the central nervous system (CNS) after bacterial meningitis. Abscesses secondary to contiguous spread of a local infection into the brain may account for about 20% of cases. In children, sinusitis, acute and chronic otitis, and mastoiditis are important sources. Although a significant decrease in the incidence of these secondary abscesses has been seen due to effective treatment of local infections, brain abscesses are still seen as sequelae in 6-8% of cases of sinusitis and in 6-10% of cases of otitis media and mastoiditis. In adults, sinusitis and osteomyelitis of adjacent skull bony structures are common sources. Brain abscesses may also occur due to direct implantation of microorganisms in penetrating head trauma and postsurgical procedures. The incidence of such abscesses in these settings ranges from about 2% to 37%. [17, 19] In about 25% of brain abscesses, a source of infection is unknown; in these so-called cryptogenic abscesses, full work-up for cardiac shunts is mandatory. The majority of brain abscesses are solitary lesions, occurring in locations close to the site of the primary source of infection. For example, abscesses related to direct spread from frontal sinuses or odontogenic foci are mostly located in the frontal lobe; abscesses secondary to ear infections are usually temporal or cerebellar. Multiple abscesses are mostly due to hematogenous spread and, although may be located in any part of the brain, are more commonly located in the distribution of the middle cerebral artery. Bacterial agents causing abscess are various and vary according to the predisposing factors and sources of infection. Abscesses may be monomicrobial or polymicrobial, again depending on the origin of the infectious source. Table 1, below, provides some of the most commonly seen agents according to the site of infection. Clinical symptoms of patients with brain abscesses vary according to the location of the abscess and the virulence of the microorganisms. The most common symptoms include fever, headache, and changes in mental status, and their duration before diagnosis may range from several hours to months. A short duration of symptoms is mostly associated with poor outcome. Depending upon the location of the abscess, focal neurologic deficits and other signs of space-occupying mass may also be present, including signs and symptoms of raised intracranial pressure. Meningismus and other signs of meningitis may also be present, because a large percentage of abscesses are accompanied by concomitant meningitis. Brain abscesses may also rupture into the ventricles, causing ventriculitis. Brain abscess initiates from direct inoculation of microorganisms into the cerebral parenchyma with focal microvascular injury. The abscesses mostly occur at the gray-white matter junction or other areas of poor blood flow/circulation, such as the deeper white matter. See the following image. Brain abscess (gross). 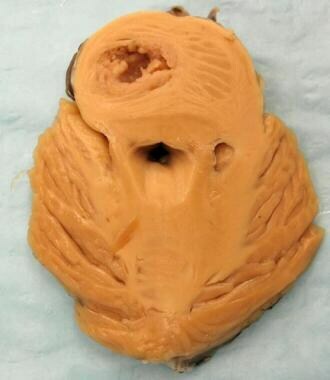 Pontine abscess showing well-formed capsule and necrotic, purulent center. Histologic findings have been well correlated with brain CT scans in an experimental model in dogs, wherein 4 stages of formation and maturation of bacterial abscess were described. The initial phase consists of a focal area of necrosis accompanied by infiltration of neutrophils, fibrinous exudate, and vascular congestion. This early cerebritis normally occurs around 1-3 days into the initial infection. The surrounding brain shows large amounts of edema and congestion. Neuroimaging shows a patchy or nonenhancing hypodensity or hypointensity on CT scan or MRI. Subdural empyema is a localized purulent infection that is confined to the subdural space. 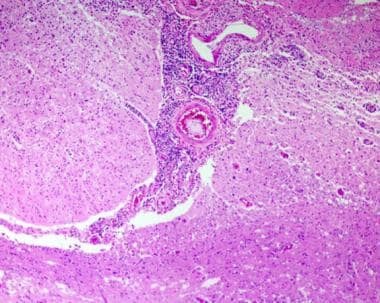 Although these lesions are less common than brain abscesses, they are similar in that they are serious infections of the central nervous system (CNS). The great majority of these cases are secondary to direct spread of a contiguous focus of infection of the sinuses, middle ear, or mastoid cavity by direct involvement or secondary to venous drainage from these structures. Hematogenous spread from a distant focus, in particular the lungs, is less common. Subdural empyemas may also develop after open head trauma and neurosurgical procedures. Clinical features of subdural empyemas include signs and symptoms of meningitis associated with increased intracranial pressure, including headaches and altered mental status. Actinomycetes are a large group of aerobic, Gram-positive bacteria that appear at microscopic analysis as branching, filamentous microorganisms. The most important cause of human infections is a subgroup known as "aerobic nocardiform actinomycetes" that includes the genera Mycobacteria, Corynebacteria, Nocardia, Rhodococcus, Gordona, and Tsukamurella. These organisms are characterized by a thick cell wall containing, among other elements, mycolic acids that are responsible for their acid-fast properties on histochemical stains. Mycobacterial infections, Whipple disease, actinomycosis, and nocardiosis will be discussed, respectively, in the following sections. In this section, tuberculosis, tuberculous meningitis, tuberculomas, tuberculous abscesses, and atypical mycobacteriosis will be discussed. CNS tuberculosis (TB) continues to be a serious public health problem due to the global increase in incidence of TB in both immunocompetent and immunocompromised individuals. Factors that have contributed to this increase are acquired immunodeficiency syndrome (AIDS) and multidrug-resistant TB. Neurotuberculosis is the most dangerous form of systemic TB, with high morbidity and mortality rates. In the central nervous system (CNS), TB may present as tuberculous meningitis, abscesses and tuberculomas, spinal meningitis, or extradural abscesses. 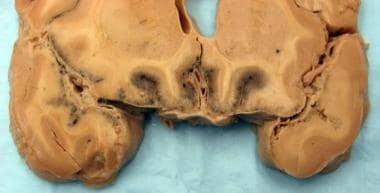 The latter may be secondary to tuberculous vertebral osteomyelitis (Pott disease). Mycobacterium tuberculosis is the most common agent in CNS TB. The M tuberculosis complex comprises 7 species in the genus Mycobacterium with a high degree of sequence identity. (For details, see Sadek M, Yue FY, Lee EY, et al. Clinical and immunologic features of an atypical intracranial mycobacterium avium complex (MAC) infection compared with those of pulmonary MAC infections. Clin Vaccine Immunol. Oct 2008;15(10):1580-9.  ) Less commonly, M bovis can cause disease in humans through animal contact and consumption of unpasteurized milk. Go to Tuberculosis for complete information on this topic. Tuberculous meningitis is the most common presentation of neurotuberculosis. Involvement of the leptomeninges may occur by 2 main pathogenic mechanisms. The most common is due to rupture of a quiescent subarachnoid tubercle that may be reactivated because of general immunosuppression of the host. The subarachnoidal tuberculous lesion arises at initial phases of disease during early bacteremia, often due to an affected lymph node eroding and discharging into a blood vessel. These small lesions may also rupture during primary infection, particularly in children and adolescents without previous contact, mostly at the same time of active primary lung disease or miliary TB. The second pathogenic mechanism of infection is by contiguous spread of an extraneural focus of infection, such as the inner ear, mastoid, or vertebrae. Macroscopically, the meningeal infection is characterized by a thick, gelatinous-appearing exudate most commonly involving the base of the brain, including the brain stem, the basal cisterns, and optic chiasm. Some opacity of the meninges over the convexity may also be present. The brain shows generalized edema and vascular congestion. 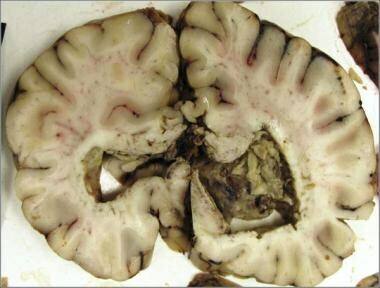 Depending upon the stage of the disease, hydrocephalus and cortical infarcts due to infective arteritis may be seen. Microscopically, the meningeal inflammatory infiltrate is composed of lymphocytes, monocytes, and epithelioid granulomas. Typical granulomas contain a central caseous necrosis surrounded by mononuclear lymphoid cells, epithelioid cells, and Langhans' giant cells (see the image below). In patients with immunodepression such as those with AIDS, the formation of granulomas may be less evident. The presence of acid-fast bacilli is variable. Meningeal, parenchymal, and subependymal small tuberculous nodules are common during the course of meningitis. Tuberculous meningitis. Mononuclear inflammatory infiltrate with ill-defined granuloma with Langhans multinucleated cell can be seen. Note the small artery with thickened wall due to endarteritis. The 2 major complications of tuberculous meningitis are cortical infarcts and hydrocephalus. The infarcts are secondary to marked vascular changes with the formation of endarteritis obliterans (see the images below). The majority of the infarcts are seen in the basal ganglia and internal capsule secondary to involvement of the basal perforating arteries. With the progression of the disease and treatment, the inflammatory exudate changes to a more fibroblastic reaction which may lead to meningeal fibrosis, obstruction of the CSF flow, and communicating hydrocephalus. Obstructive hydrocephalus may also develop secondary to focal obstruction of the aqueduct or ventricular foramen due to granulomatous ependymitis. Tuberculous meningitis. Tuberculous meningitis accompanying tuberculous abscess. Extensive inflammatory infiltrates and several arteries show endarteritis and/or occlusion. Note the superficial cortical infarction due to endarteritis (lower right). Tuberculous meningitis. 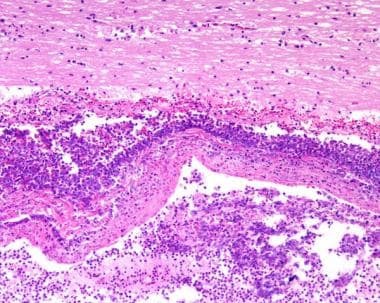 Tuberculous endarteritis with thrombosis is seen, with consequent brain infarction. Tuberculous meningitis may also involve the spinal cord, wherein compression of the nerve roots by the thick exudate and subsequent fibrosis may occur. Go to Tuberculous Meningitis for complete information on this topic. The most common form of parenchymal involvement by TB is the tuberculous granuloma or tuberculoma. The majority of tuberculomas develop from hematogenous spread and tend to be located at the gray-white matter interface. Tuberculomas may also develop from extension of tuberculous meningitis into the adjacent parenchyma via cortical veins or perivascular Virchow-Robin spaces around small penetrating arteries. The neuroimaging findings of these lesions depend on whether the tuberculoma shows a caseating central necrosis or is a more solid lesion with fibrosis and/or calcification. (For a review, see Bernaerts A, Vanhoenacker FM, Parizel PM, et al. TB of the central nervous system: overview of neuroradiological findings. Eur Radiol. Aug 2003;13(8):1876-90.  ) In general, the lesions are well-circumscribed, oval or lobular, with variable degrees of enhancement. Early lesions are normally surrounded by vasogenic edema. Solid lesions with caseating necrosis may have a typical ring-enhancing appearance. Grossly, tuberculomas are relatively circumscribed lesions with a necrotic center and surrounded by a gelatinouslike, firm capsule. The necrotic, caseating center of the granuloma may have a white-grayish appearance. Most tuberculomas are located at the gray-white matter interface. The surrounding parenchyma may show firmness due to reactive gliosis. Microscopically, tuberculomas are caseating granulomas composed of a central zone of necrosis surrounded by a capsule of collagenous tissue, epithelioid cells, multinucleated giant cells, and mononuclear inflammatory cells. M tuberculosis forms are only rarely seen by acid-fast stains. The surrounding parenchyma may show variable degree of edema and astrocytic proliferation. Tuberculomas may become fibrotic and calcified with small degree of inflammatory reaction. Tuberculous abscess formation is a rare complication even in TB endemic areas. This lesion mostly occurs in patients with abnormal cell-mediated immunity, particularly in patients with AIDS or other immunodeficiencies that preclude a granulomatous inflammatory response. Patients with tuberculous abscess tend to have a more severe clinical presentation than those with tuberculomas, with a shorter duration of symptoms similar to pyogenic abscesses. Likewise, neuroradiologic findings are very similar to other abscesses. Histologically, tuberculous abscesses are composed of a necrotic, purulent center surrounded by a loose capsule without an epithelioid granulomatous reaction. In contrast to tuberculomas, which contain few bacilli, tuberculous abscesses contain abundant M tuberculosis bacilli. See the image below. Tuberculous abscess. Early encapsulation of a tuberculous abscess with mononuclear inflammatory infiltrates is present. Very rare acid-fast bacilli were identified in the necrotic center. Atypical mycobacteriosis may be associated with meningitis, abscesses, and rarely, meningoencephalitis. 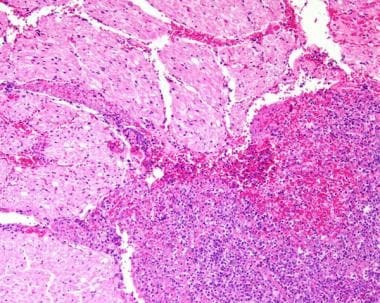 Lesions mimicking tumors have been described in immunocompetent patients. 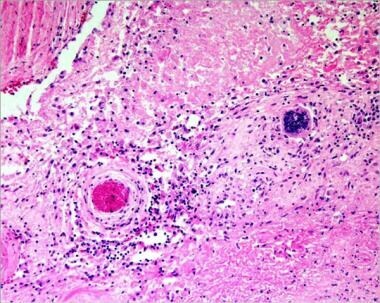 [39, 40] Histopathologically, the lesions consisted of small aggregates of lymphocytes and macrophages that contain acid-fast microorganisms without caseating necrosis or multinucleated giant cells and present in a predominantly perivascular location. Neurologic disease has been described in 3 clinical scenarios: neurologic involvement in classic Whipple disease, neurologic relapse of previously treated Whipple disease, and isolated neurologic manifestation without evidence of intestinal involvement. [42, 43] A recent review of the literature revealed 24 cases of cerebral Whipple disease without systemic involvement. Clinical manifestations are varied and may mimic any major neurologic condition; the most common are cognitive dysfunctions, including memory impairment, confusion, or dementia. Visual disturbances that include supranuclear ophthalmoplegia in combination with oculofacioskeletal myorhythmia are considered highly suggestive of Whipple disease. Involvement of the CNS by actinomycosis is rare, with a reported incidence ranging from 1% to 15% of patients with disease. In a large series of pyogenic abscesses, Actinomyces abscesses represented less than 2% of cases. Brain abscess is the most common CNS manifestation of actinomycosis; therefore, clinical symptoms and signs are secondary to mass-effect, including focal neurologic deficits and headache. The infections may also present as chronic meningitis secondary to spread of a parameningeal infection, most commonly the middle ear and paranasal sinuses. Less commonly, actinomycosis may present as meningoencephalitis, subdural empyema, and epidural abscess. 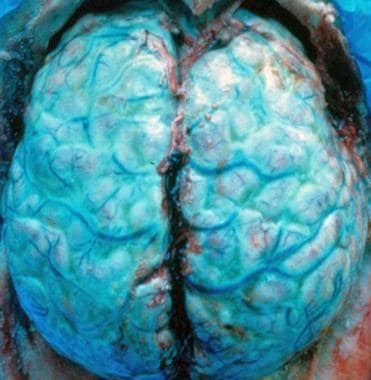 Grossly, the lesions are usually multilocular abscesses with a necrotic center and thick wall, with a clear demarcation from the surrounding brain parenchyma (see the image below). Histologically, the necrotic center contains dense infiltration of neutrophils, necrotic debris, and colonies of branching organisms forming sulfur granules (see the following image). The outer zone of the lesion is formed by granulation tissue containing fibroblasts, neoformed capillaries, and mononuclear inflammatory cells. 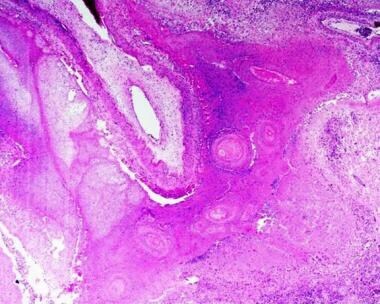 Less frequently, solid nodular or mass lesions termed actinomycetomas or actinomycotic granuloma may occur. Characteristically, the bacteria are gram-positive, non–acid-fast, and methenamine silver–positive filamentous organisms. The abscesses of Nocardia may be single or multiple. Microscopically, these abscesses contain extensive suppuration with acute inflammatory infiltrates similar to those seen in pyogenic abscesses. A fibrous wall surrounds the abscess. Granulomatous inflammatory reaction is rare. The filamentous microorganisms are gram-positive, partially acid-fast positive, and strongly positive by silver impregnation, such as with Grocott methenamine-silver. Schlech WF 3rd, Ward JI, Band JD, Hightower A, Fraser DW, Broome CV. Bacterial meningitis in the United States, 1978 through 1981. The National Bacterial Meningitis Surveillance Study. JAMA. 1985 Mar 22-29. 253(12):1749-54. [Medline]. Nudelman Y, Tunkel AR. Bacterial meningitis: epidemiology, pathogenesis and management update. Drugs. 2009. 69(18):2577-96. [Medline]. Pediatric bacterial meningitis surveillance - African region, 2002--2008. MMWR Morb Mortal Wkly Rep. 2009 May 15. 58(18):493-7. [Medline]. Kim KS. Pathogenesis of bacterial meningitis: from bacteraemia to neuronal injury. Nat Rev Neurosci. 2003 May. 4(5):376-85. [Medline]. Dery MA, Hasbun R. Changing epidemiology of bacterial meningitis. Curr Infect Dis Rep. 2007 Jul. 9(4):301-7. [Medline]. Bilukha OO, Rosenstein N. Prevention and control of meningococcal disease. Recommendations of the Advisory Committee on Immunization Practices (ACIP). MMWR Recomm Rep. 2005 May 27. 54:1-21. [Medline]. Cohn AC, MacNeil JR, Harrison LH, Hatcher C, Theodore J, Schmidt M, et al. Changes in Neisseria meningitidis disease epidemiology in the United States, 1998-2007: implications for prevention of meningococcal disease. Clin Infect Dis. 2010 Jan 15. 50(2):184-91. [Medline]. Grossman RI, Yousem DM. Infectious and noninfectious inflammatory diseases of the brain. Grossman RI, Yousem DM. Neuroradiology: the Requisites. 2nd ed. Philadelphia, Pa: Mosby; 2003. Chapter 6. Katchanov J, Heuschmann PU, Endres M, Weber JR. Cerebral infarction in bacterial meningitis: predictive factors and outcome. J Neurol. 2010 May. 257(5):716-20. [Medline]. Edwards MS, Baker CJ. Complications and sequelae of meningococcal infections in children. J Pediatr. 1981 Oct. 99(4):540-5. [Medline]. Tunkel AR, Van de Beek D, Scheld WM. Acute meningitis. Mandell GL, Bennett JE, Dolin R, eds. Mandell, Douglas, and Bennett's Principles and Practice of Infectious Diseases. 7th ed. Philadelphia, Pa: Churchill Livingstone-Elsevier; 2010. Chapter 84. Durand ML, Calderwood SB, Weber DJ, Miller SI, Southwick FS, Caviness VS Jr, et al. Acute bacterial meningitis in adults. A review of 493 episodes. N Engl J Med. 1993 Jan 7. 328(1):21-8. [Medline]. Brown E, Gray F. Greenfield’s Neuropathology. Love S, Louis DN, Ellison DW, eds. Bacterial infections. 8th ed. London, UK: Hodder Arnold; 2009. Chapter 18. Sharma R, Mohandas K, Cooke RP. Intracranial abscesses: changes in epidemiology and management over five decades in Merseyside. Infection. 2009 Feb. 37(1):39-43. [Medline]. Mamelak AN, Mampalam TJ, Obana WG, Rosenblum ML. Improved management of multiple brain abscesses: a combined surgical and medical approach. Neurosurgery. 1995 Jan. 36(1):76-85; discussion 85-6. [Medline]. Tunkel AR. Brain abscess. Mandell GL, Bennett JE, Dolin R, eds. Mandell, Douglas, and Bennett's Principles and Practice of Infectious Diseases. 7th ed. Philadelphia, Pa: Churchill Livingstone-Elsevier; 2010. Chapter 88. Carpenter J, Stapleton S, Holliman R. Retrospective analysis of 49 cases of brain abscess and review of the literature. Eur J Clin Microbiol Infect Dis. 2007 Jan. 26(1):1-11. [Medline]. Frazier JL, Ahn ES, Jallo GI. Management of brain abscesses in children. Neurosurg Focus. 2008. 24(6):E8. [Medline]. Dashti SR, Baharvahdat H, Spetzler RF, Sauvageau E, Chang SW, Stiefel MF, et al. Operative intracranial infection following craniotomy. Neurosurg Focus. 2008. 24(6):E10. [Medline]. Cavusoglu H, Kaya RA, Türkmenoglu ON, Colak I, Aydin Y. Brain abscess: analysis of results in a series of 51 patients with a combined surgical and medical approach during an 11-year period. Neurosurg Focus. 2008. 24(6):E9. [Medline]. Britt RH, Enzmann DR, Placone RC Jr, Obana WG, Yeager AS. Experimental anaerobic brain abscess. Computerized tomographic and neuropathological correlations. J Neurosurg. 1984 Jun. 60(6):1148-59. [Medline]. Lee TH, Chang WN, Su TM, Chang HW, Lui CC, Ho JT, et al. Clinical features and predictive factors of intraventricular rupture in patients who have bacterial brain abscesses. J Neurol Neurosurg Psychiatry. 2007 Mar. 78(3):303-9. [Medline]. [Full Text]. Tonon E, Scotton PG, Gallucci M, Vaglia A. Brain abscess: clinical aspects of 100 patients. Int J Infect Dis. 2006 Mar. 10(2):103-9. [Medline]. Kao PT, Tseng HK, Liu CP, Su SC, Lee CM. Brain abscess: clinical analysis of 53 cases. J Microbiol Immunol Infect. 2003 Jun. 36(2):129-36. [Medline]. Sorrell TC, Mitchell DH, Iredell JR, Chen SC-A. Chapter 254. Mandell GL, Bennett JE, Dolin R, eds. Mandell, Douglas, and Bennett's Principles and Practice of Infectious Diseases. 7th ed. Philadelphia, Pa: Churchill Livingstone-Elsevier; 2010. World Health Organization (WHO). Global tuberculosis control: a short update to the 2009 report. Available at http://at http://www.who.int/tb/publications/global_report/en/. Accessed: February 8, 2011. Centers for Disease Control and Prevention. Reported Tuberculosis in the United States, 2008. Atlanta Ga: CDC; September 2009. Sadek M, Yue FY, Lee EY, Gyenes G, Jones RB, Hoffstein V, et al. Clinical and immunologic features of an atypical intracranial mycobacterium avium complex (MAC) infection compared with those of pulmonary MAC infections. Clin Vaccine Immunol. 2008 Oct. 15(10):1580-9. [Medline]. [Full Text]. Fizgerald DW, Sterling TR, Haas DW. Mycobacterium tuberculosis. Mandell GL, Bennett JE, Dolin R, eds. Mandell, Douglas, and Bennett's Principles and Practice of Infectious Diseases. 7th ed. Philadelphia, Pa: Churchill Livingstone-Elsevier; 2010. Chapter 250. Bernaerts A, Vanhoenacker FM, Parizel PM, Van Goethem JW, Van Altena R, Laridon A, et al. Tuberculosis of the central nervous system: overview of neuroradiological findings. Eur Radiol. 2003 Aug. 13(8):1876-90. [Medline]. Thwaites G, Fisher M, Hemingway C, Scott G, Solomon T, Innes J. British Infection Society guidelines for the diagnosis and treatment of tuberculosis of the central nervous system in adults and children. J Infect. 2009 Sep. 59(3):167-87. [Medline]. Ramdurg SR, Gupta DK, Suri A, Sharma BS, Mahapatra AK. Spinal intramedullary tuberculosis: a series of 15 cases. Clin Neurol Neurosurg. 2009 Feb. 111(2):115-8. [Medline]. Ravenscroft A, Schoeman JF, Donald PR. Tuberculous granulomas in childhood tuberculous meningitis: radiological features and course. J Trop Pediatr. 2001 Feb. 47(1):5-12. [Medline]. Muthukumar N, Sureshkumar V, Ramesh VG. En plaque intradural extramedullary spinal tuberculoma and concurrent intracranial tuberculomas: paradoxical response to antituberculous therapy. Case report. J Neurosurg Spine. 2007 Feb. 6(2):169-73. [Medline]. Kumar R, Pandey CK, Bose N, Sahay S. Tuberculous brain abscess: clinical presentation, pathophysiology and treatment (in children). Childs Nerv Syst. 2002 Apr. 18(3-4):118-23. [Medline]. Gordin FM, Horsburgh CR Jr. Mycobacterium avium complex. Mandell GL, Bennett JE, Dolin R, eds. Mandell, Douglas, and Bennett's Principles and Practice of Infectious Diseases. 7th ed. Philadelphia, Pa: Churchill Livingstone-Elsevier; 2010. Chapter 252. Di Patre PL, Radziszewski W, Martin NA, Brooks A, Vinters HV. 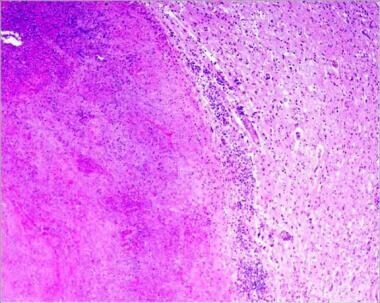 A meningioma-mimicking tumor caused by Mycobacterium avium complex in an immunocompromised patient. Am J Surg Pathol. 2000 Jan. 24(1):136-9. [Medline]. Dickerman RD, Stevens QE, Rak R, Dorman SE, Holland SM, Nguyen TT. Isolated intracranial infection with Mycobacterium avium complex. J Neurosurg Sci. 2003 Jun. 47(2):101-5; discussion 105. [Medline]. La Scola B, Fenollar F, Fournier PE, Altwegg M, Mallet MN, Raoult D. Description of Tropheryma whipplei gen. nov., sp. nov., the Whipple's disease bacillus. Int J Syst Evol Microbiol. 2001 Jul. 51:1471-9. [Medline]. Fenollar F, Puéchal X, Raoult D. Whipple's disease. N Engl J Med. 2007 Jan 4. 356(1):55-66. [Medline]. Schneider T, Moos V, Loddenkemper C, Marth T, Fenollar F, Raoult D. Whipple's disease: new aspects of pathogenesis and treatment. Lancet Infect Dis. 2008 Mar. 8(3):179-90. [Medline]. Marth T, Raoult D. Whipple's disease. Lancet. 2003 Jan 18. 361(9353):239-46. [Medline]. Gerard A, Sarrot-Reynauld F, Liozon E, Cathebras P, Besson G, Robin C, et al. Neurologic presentation of Whipple disease: report of 12 cases and review of the literature. Medicine (Baltimore). 2002 Nov. 81(6):443-57. [Medline]. Guthikonda B, Rouah E, Krishnan B, Powell SZ, Goodman JC, Gopinath SP, et al. Whipple disease of the central nervous system: an unusual occurrence in association with acquired immune deficiency syndrome. J Neurosurg. 2010 May. 112(5):983-9. [Medline]. Mohamed W, Neil E, Kupsky WJ, Juhász C, Mittal S, Santhakumar S. Isolated intracranial Whipple's disease--report of a rare case and review of the literature. J Neurol Sci. 2011 Sep 15. 308(1-2):1-8. [Medline]. von Herbay A, Ditton HJ, Schuhmacher F, Maiwald M. Whipple's disease: staging and monitoring by cytology and polymerase chain reaction analysis of cerebrospinal fluid. Gastroenterology. 1997 Aug. 113(2):434-41. [Medline]. Famularo G, Minisola G, De Simone C. A patient with cerebral Whipple's disease and a stroke-like syndrome. Scand J Gastroenterol. 2005 May. 40(5):607-9. [Medline]. Baisden BL, Lepidi H, Raoult D, Argani P, Yardley JH, Dumler JS. Diagnosis of Wihipple disease by immunohistochemical analysis: a sensitive and specific method for the detection of Tropheryma whipplei (the Whipple bacillus) in paraffin-embedded tissue. Am J Clin Pathol. 2002 Nov. 118(5):742-8. [Medline]. Marth T. New insights into Whipple's disease - a rare intestinal inflammatory disorder. Dig Dis. 2009. 27(4):494-501. [Medline]. Schnider PJ, Reisinger EC, Gerschlager W, Müller C, Berger T, Krejs GJ, et al. Long-term follow-up in cerebral Whipple's disease. Eur J Gastroenterol Hepatol. 1996 Sep. 8(9):899-903. [Medline]. Russo TA. Agents of actinomycosis. Mandell GL, Bennett JE, Dolin R, eds. . Mandell, Douglas, and Bennett's Principles and Practice of Infectious Diseases. 7th ed. Philadelphia, Pa: Churchill Livingstone-Elsevier; 2010. Chapter 255. Chaudhry SI, Greenspan JS. Actinomycosis in HIV infection: a review of a rare complication. Int J STD AIDS. 2000 Jun. 11(6):349-55. [Medline]. Sharma BS, Banerjee AK, Sobti MK, Kak VK. Actinomycotic brain abscess. Clin Neurol Neurosurg. 1990. 92(4):373-6. [Medline]. Dailey AT, LeRoux PD, Grady MS. Resolution of an actinomycotic abscess with nonsurgical treatment: case report. Neurosurgery. 1993 Jan. 32(1):134-6; discussion 136-7. [Medline]. Wang S, Wolf RL, Woo JH, Wang J, O'Rourke DM, Roy S, et al. Actinomycotic brain infection: registered diffusion, perfusion MR imaging and MR spectroscopy. Neuroradiology. 2006 May. 48(5):346-50. [Medline]. Corti ME, Villafañe-Fioti MF. Nocardiosis: a review. Int J Infect Dis. 2003 Dec. 7(4):243-50. [Medline]. Centers for Disease Control and Prevention. Nocardiosis: technical information. Available at http://www.cdc.gov/nczved/divisions/dfbmd/diseases/nocardiosis/technical.html. Accessed: February 8, 2011. Mamelak AN, Obana WG, Flaherty JF, Rosenblum ML. Nocardial brain abscess: treatment strategies and factors influencing outcome. Neurosurgery. 1994 Oct. 35(4):622-31. [Medline]. Chedid MB, Chedid MF, Porto NS, Severo CB, Severo LC. Nocardial infections: report of 22 cases. Rev Inst Med Trop Sao Paulo. 2007 Jul-Aug. 49(4):239-46. [Medline]. Zakaria A, Elwatidy S, Elgamal E. Nocardia brain abscess: severe CNS infection that needs aggressive management; case report. Acta Neurochir (Wien). 2008 Oct. 150(10):1097-101; discussion 1101. [Medline]. Tuberculosis (gross). Tuberculous abscess from a patient with disseminated tuberculosis. Note the infarction of the corpus callosum and cortex surrounding the abscess.